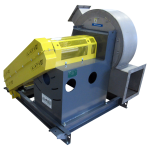 High-temperature process airstreams are conveyed using specially designed centrifugal fans that can handle temperatures of up to 1800 degrees F. Fans and blowers not properly designed for this purpose will catastrophically fail when used at temperatures above their design. 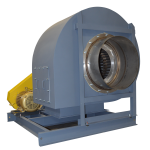 AirPro is a leading manufacturer of custom, high-temperature centrifugal fans and is ready to work with you to design a fan that fits your specific application requirements. Contact us here to discuss your high temperature fan application with our experts.